Misa Shin, Executive Director of Art Fair Tokyo, talks about the history of the fair and the strengths and weaknesses of the Japanese art market. 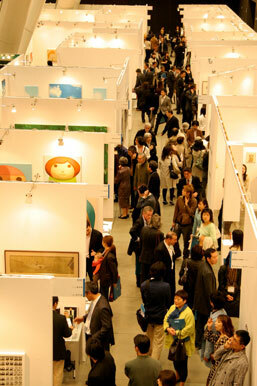 Now in its third year, Art Fair Tokyo 2008 is being held from April 3 to April 6 at the International Forum in Yurakucho. 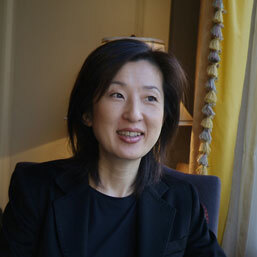 Having obtained her MA from New York University, and worked for several art projects there, Misa Shin was a manager of PR and Development at Mori Art Museum before being appointed Executive Director of Art Fair Tokyo in 2005. This interview is an extract from Art Space Tokyo (Chin Music Press, 2008) an intimate guide to the Tokyo art world that features 20 interviews with the directors and curators behind some of Tokyo’s most distinctive galleries and museums, and many others. To find out more, see the Art Space Tokyo homepage. What is the history of Art Fair Tokyo? 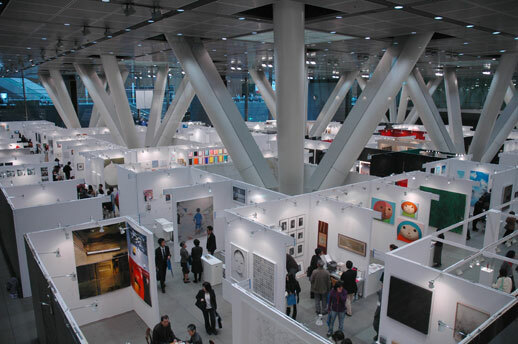 Art Fair Tokyo started off as the Nippon International Contemporary Art Fair (NICAF) in 1992. It was Asia’s first major art fair. At that time it focused only on contemporary art. The planning was done during the bubble era, and the fair launched just as the bubble burst. At first people were optimistic, saying “Oh the economy will get better soon, it’ll be alright,” but the economy gradually got worse and the 1990s ended up being the ‘lost decade.’ With the economy in such a bad state, NICAF was having trouble filling all its booths. As a result they went out of their way to bring in galleries from abroad, and a lot of rental galleries and other second-rate galleries ended up taking part as well, which brought down the quality of the whole event. It was an inevitable consequence of the times: there was no art market in Japan at the time, and yet they set up an art fair. Normally you would set up an art fair on the back of an existing market, but in this case the art fair was being held in the hope of jumpstarting the market. It was an extremely impossible set of circumstances for anyone to work with. NICAF deteriorated greatly in the late 1990s, and I think it was hugely damaging to Japan to lose an art fair like that. What does Art Fair Tokyo aim to achieve?How did NICAF make the transition to being Art Fair Tokyo? When NICAF collapsed, a number of people from the art world like Hozu Yamamoto, Shugo Satani, Tomio Koyama, Atsuko Koyanagi and Masami Shiraishi got together and thought about how to revive the fair. At that time the Japanese contemporary art market was incredibly small, so they thought about allowing the fair to include yoga, nihonga and antique artwork. Having the ‘C’ for ‘Contemporary’ in NICAF limited the fair to that genre, so in 2005 it was relaunched as Art Fair Tokyo. Japanese people already love to look at art: the Jakuchu Ito show held at the Tokyo National Museum was the most visited exhibition of 2006 worldwide. Second was the Tsuguharu Foujita exhibition at the National Museum of Modern Art, Tokyo. Of the top ten most visited exhibitions in the world, five of them took place in Japan. However, going to look at artwork in a museum and actually buying it are two completely different levels of commitment. A lot of Japanese people can’t understand what it is to buy an artwork until they have actually done it, and Art Fair Tokyo is offering a lot of people the chance to do that. People often find galleries intimidating: it’s hard for a lot of people to ask the price of an artwork; they’re afraid that they will be looked down on. Art fairs alleviate those two problems: everything is open, there are a lot of people around and the prices are clearly marked everywhere. You can compare prices with neighboring galleries easily and measure that against your budget. Why mix antique, modern and contemporary art galleries in the same fair? The contemporary art market in Japan is very young and extremely limited, whereas the markets for yoga, nihonga and antique artwork are well-established. By putting all these genres together you can create a single, unique market. There are already art fairs like this elsewhere in the world, such as the European Fine Art Fair in Maastricht, which also has modern art and antique galleries exhibiting in the same place. Art Fair Tokyo is not Art Basel: we don’t have people arriving in their private jets every year. At present there are about 150 major art fairs in the world, and many more if you add all the smaller ones. Every region is different and each art fair has its own distinctive characteristics. Is there anything noticeable in the buying habits of Japanese collectors that sets them apart from foreign collectors? Japanese collectors like all sorts of things: they are cultural omnivores. By contrast, Chinese collectors only buy Chinese contemporary art. Having antique works, yoga, nihonga and contemporary artwork all together in the same place is suited to Japanese buying habits. Antiques collectors come to Art Fair Tokyo and see contemporary works they like; meanwhile, a lot of contemporary art collectors leave having bought antiques. Being a part of Art Fair Tokyo even led me to buy a work of nihonga for the first time. Had I not been working there, I probably would never have gone to a nihonga gallery; they have a stuffy image and I was under the impression that the works were more expensive than they actually are. How come the domestically oriented antiques and crafts market remains so powerful in Tokyo? Can those galleries integrate themselves into a more internationally oriented art market? It seems that the galleries handling antiques, yoga and nihonga have realized that they need to change their business practice if they are to keep up. In particular I am thinking of the older galleries that have been passed down two or three generations. These younger people running the old style galleries are now starting to visit the international events like the Venice Biennale, Art Basel and documenta. If they don’t change, then they won’t be able to keep up with the art fairs of today and it won’t be good for their artists either. I really strongly believe that they need to get out there and see what’s going on at an international level. What has Art Fair Tokyo learned from other art fairs around the world? How does it establish its identity in relation to other Asian fairs? There are a lot of art fairs in Asia now, in Beijing, Shanghai, Seoul, Singapore and Hong Kong just for starters. Everyone has this unreasonable obsession with being international: I always get asked how many international galleries there are taking part in Art Fair Tokyo, and when I say there are only seven out of 108, people react with surprise. But I think this is a good state to be in. Obviously I don’t want to get rid of the foreign galleries, but I think the main priority for a Japanese art fair should be to present the best of Japanese artwork. The other Asian art fairs have all chosen to go down the international route and as a result, you have some very average galleries taking part. When I go to Beijing, I really want to see the best of what Beijing has to offer, but with all the money they’re making at the moment, the Chinese are fixated on showing the likes of Damian Hirst and Andy Warhol. I think if you really want a Hirst or a Warhol, you should go to London or New York. It doesn’t make sense to go to Shanghai for it. How do you think the Chinese contemporary art boom might affect Japan’s market? I think the whole of Asia will come into focus as a result of the Chinese art boom. Chinese contemporary art has become so expensive that the focus will inevitably shift to Japan. China is developing so rapidly, and art is being incorporated into a variety of different strategies, cultural political, commercial, investment and otherwise. The Chinese also have a very strong desire to make money. But the risk is that China is entering a bubble like Japan did in the 1980s. At that time the Japanese art market was worth $10 billion, but all the investment was going into Impressionists, rather than living Japanese artists, which was part of why the market crashed. The Japanese art market now is only worth ten percent of what it was back then, but at least this is a real number and not a bubble. China’s art boom will have a positive influence on Japan, but equally China needs to learn from Japan’s past mistakes. How does the emergence of 101Tokyo as the first satellite fair to Art Fair Tokyo change things? I think it’s great. This year’s applications to Art Fair Tokyo exceeded the number of places we have available. We are scheduled to continue using the International Forum as our venue for the next few years, but we have already come to the limit of its three-thousand-square-meter capacity. We don’t rent the booth walls but have them made ourselves, and all of this material needs to be kept in a warehouse, which of course costs us a lot of money. The Tokyo city government should be supporting us, but we don’t get any financial assistance from them whatsoever. For those physical and financial reasons we are unable to expand, so I think it’s is great that some young people have decided to get together and set up a satellite fair — 101Tokyo has come along at just the right time. So, do you think that compared to other large cities elsewhere in the world, Tokyo’s art world receives insufficient investment from the government? There is an incredible lack of investment from the government. In fact, I believe that Tokyo Wonder Site may even have a higher budget than the Museum of Contemporary Art, Tokyo. We asked the Tokyo government for support, but their reaction was basically “Art Fair Tokyo is just a trade show, isn’t it? We don’t support events for buying and selling.” They haven’t a clue what an art fair is all about. This is in huge contrast to fairs like ARCO in Madrid, for example. There, the government treats the art world as a real industry and gives it a lot of support: every year they invite two to three hundred VIPs from all over the world to the fair and cover the costs of their accommodation, and then the media hold a big party for everyone, making it into a real event. Nevertheless the Tokyo art market is slowly growing. What are the main changes that you have seen? It’s only now that private collectors are really starting to emerge. During the bubble era, it was mostly corporations that were doing the collecting, but that has completely changed. Art museums aren’t buying anymore, so I think it’s really good that the number of individuals buying artworks for their own pleasure has increased. Art Fair Tokyo’s buyers are all private collectors. How much are foreign investors a factor in the growth of the Japanese art market? Is the market vulnerable because of its dependence on foreign investors? That’s quite possible. I don’t have the precise figures, but Art Fair Tokyo puts a lot of its resources into foreign publicity; the market in Japan is so small that it isn’t enough just to focus on Japanese buyers. Japanese art is very popular abroad, particularly among Asian buyers, so I want more of them to come to Japan. But in truth, what we really need is for Japanese people to be buying Japanese art. That is what will bolster the art market here and turn art into a more robust industry. What is it that holds the Japanese art market back? Well, it all comes down to economics in the end. It’s the same for Art Fair Tokyo and for public museums, but so many of the people working in the Japanese art market are women, students and volunteers. Men are rarely willing to work in such a precarious field for such little pay, whereas students and volunteers are. Of course there are some outstanding, talented people among them, but the fact is that everyone is working for very little pay, or for nothing at all. This situation is not good for sustaining their motivation and cultivating their talent. I think the Japanese art world has to become more of a robust and mature industry, one that can generate more professions. The Japanese government has to start investing more in the art world in order to motivate people to follow a lifelong career as art critics, art historians, art professor, curators and gallery owners, as well as all the professions that support those roles, like administration, PR, development and marketing. Without this investment, the art market here can never fully mature.